Carlos Hathcock was born on May 20, 1942 and died of complications of Multiple Sclerosis on February 23, 1999. 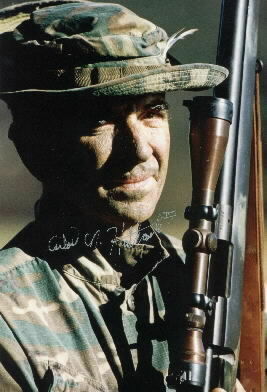 He was a United States Marine Corps sniper with a record of 93 confirmed kills in Vietnam. He was the subject of four separate non-fiction books and is referenced in several fictional works and TV shows as well. Gunnery Sergeant Hatchcock was badly burned when a vehicle he was riding in hit a mine in 1969. He personally rescued seven fellow Marines from the vehicle and was eventually awarded the Silver Star for Valor. While being treated for the pain associated with the burns, it was discovered that he was suffering from MS. He was forced to take a medical retirement from the Marine Corps but remained active as a weapons instructor with the military and law enforcement. I always heard, admired Carlos Hathcock for his skill and accomplishments as a Marine sniper. I never knew he had ms like i do until today when I searched on Marines and MS together. He was quite a man/Marine as I know how I suffer with ms myself. This is a great honor to read an article about the hero of a Nation. The 93 kill he made was for his own nation. I respect him and I salute him for his service to this country. May his soul rest in peace and let him reach the heaven. Thanks, Kevin for sharing. Marines, as well as soldiers in all the other branches of the military, are some of the bravest people I know. They deserve our support. When you add something like MS in the mix, it's pretty amazing that people like Carlos can still accomplish so much. Thanks again for sharing Carlos' story.